Preheat oven to 180°C (350°F). Place the chocolate and butter in a small saucepan over low heat and stir until melted and smooth. Set aside. Place the sugar, eggs, flour and cocoa in a bowl with the chocolate mixture and mix until well combined. Pour into a lightly greased 20cm-square cake tin lined with non-stick baking paper and cook for 30–35 minutes or until set. Allow to cool in the tin. To make the caramel crunch, place the sugar and water in a medium saucepan over low heat and stir, brushing any sugar crystals from the sides of the pan with a wet pastry brush. When the sugar is dissolved, increase heat to high, bring to the boil and cook, without stirring, for 8–10 minutes until golden and the mixture reaches 160°C (350°F) on a sugar thermometer. Carefully add the cream and butter and stir until well combined. 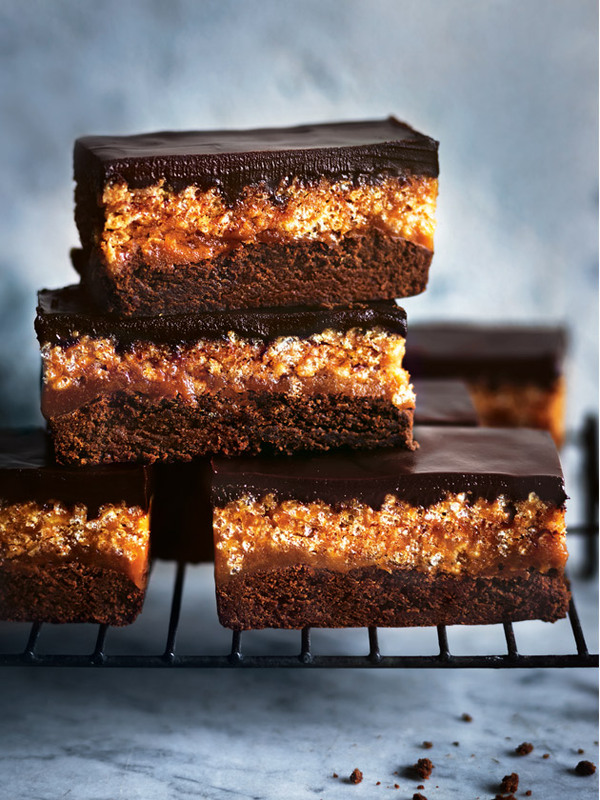 Stir through the puffed rice and pour the caramel mixture over the brownie, smoothing the top. Set aside for 30 minutes at room temperature or until almost set. To make the chocolate ganache, place the chocolate and cream in a saucepan over low heat and stir until melted and smooth. Pour over the caramel mixture and allow to cool at room temperature for 3 hours or until set. Slice to serve. Serves 12. Note: Store brownies in an airtight container at room temperature, not in the refrigerator, and enjoy within two days.